Nothing says Christmastime more than this decorative holly bowl. 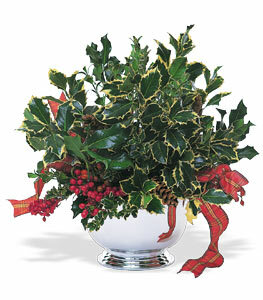 With its bright green waxy leaves, holly makes the season quite jolly. We would like to welcome you to our new web site. As a premium florist, we pledge to go beyond your expectations. We respect nature and strive to enhance your appreciation for nature´s gifts by offering only the freshest, highest quality flowers and creative floral designs that spark your imagination. As a business, we pride ourselves on intelligent, personal service. We are committed to achieving the legendary level of service that nurtures long-term relationships that make you a customer for life. As human beings, we take part in life! We believe in serving the community, preserving the environment, fostering personal development and encouraging social responsibility. 2019 © QuickFlora. All Rights Reserved.